This is your chance to tell candidates why they’d want to join your company. When writing the summary, keep in mind you’re writing for tech talent. Don’t be afraid to get technical. What cool extras do you offer candidates at your company? It can sometimes be tricky to think of perks. We’ve found it’s easiest if you consider other companies and what they offer. For instance, many companies have a strict 9am to 5pm work day, but if you have more flexible hours then list those. 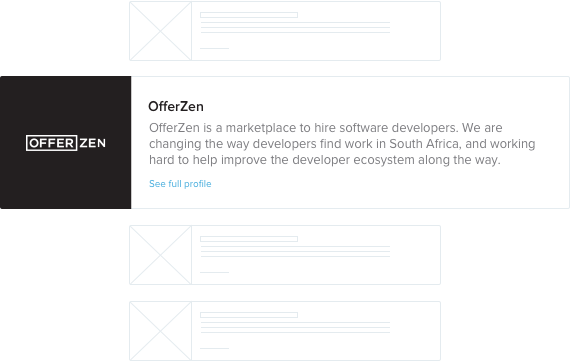 If you need some inspiration and want to check out other company profiles you can view the list of all the companies currently hiring on OfferZen. Your elevator pitch will be displayed on the list of companies hiring on OfferZen. Try keep this to the description to a single paragraph. If you want to include office photos on your company profile, we will send a professional photographer around to take some photos of your office and team (free of charge). Having photo's is not essential to start meeting candidates but it's a nice touch for them to be able to see your offices.